MILWAUKEE (AP) — A 19-year-old pregnant woman, her toddler and a man all drowned when their car crashed into a Milwaukee river while police were pursuing them as suspects in two armed robberies. Autopsy results released Thursday found the woman, Shannon Nehmer, was several weeks pregnant and that 29-year-old Charles Barefield was driving the car. Police believe he was Nehmer’s boyfriend. The toddler was Nehmer’s 2-year-old daughter, Annamelia Hernandez. Police officers had initiated a traffic stop Monday evening because the Chevy Trailblazer Barefield was driving matched the description of a car used in two armed robberies earlier that day. When the car fled, police chased it, but the driver lost control and the SUV ended up in the Kinnickinnic River. The body of Nehmer was recovered from the water that night and she was pronounced dead at the scene. Divers found the bodies of the toddler and Barefield on Tuesday afternoon after the SUV was removed from the water. The Milwaukee County Medical Examiner said Thursday that they all died from asphyxia due to fresh-water drowning. Police Capt. 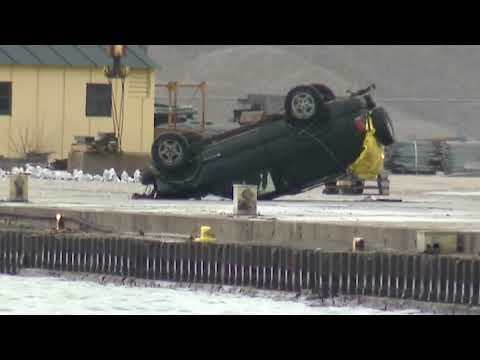 William Beauchene said the vehicle was submerged in 30 feet (9 meters) of water. Beauchene said the first robbery happened at about 7 p.m. Monday, when a man who was checking fluids under his car was approached by people who had climbed out of a black Chevy Trailblazer. The man said they demanded money at gunpoint and he was struck in the face before one of the suspects took his phone and everyone left. About 25 minutes later, two other people were robbed at gunpoint, Beauchene said. The robbery victims told police that they had been attacked by two men and a woman. Police say the third suspect is in custody and that investigators have recovered the gun used in the robberies. The third suspect wasn’t in the car during the police chase. Police said the toddler was probably in the car during the robberies, but they don’t know for certain.